Haven’t I seen you around? In 2009 our famed Global Internet Map made it to the walls of Museum für Kommunikation Frankfurt—an institution dedicated to all things communication. The permanent exhibition displays three channels of communication: seeing, hearing, writing, and their integration on the internet. This final step is where our map comes in. The exhibition showcases the evolution of communication networks, beginning with an early stagecoach map and working forward to depictions of the modern internet. 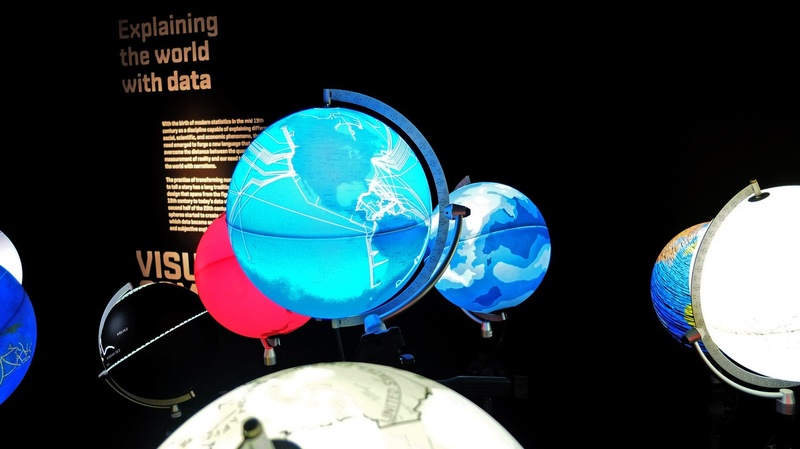 In 2016 we also had the special opportunity to be part of the globe-trotting Big Bang Data Exhibition. 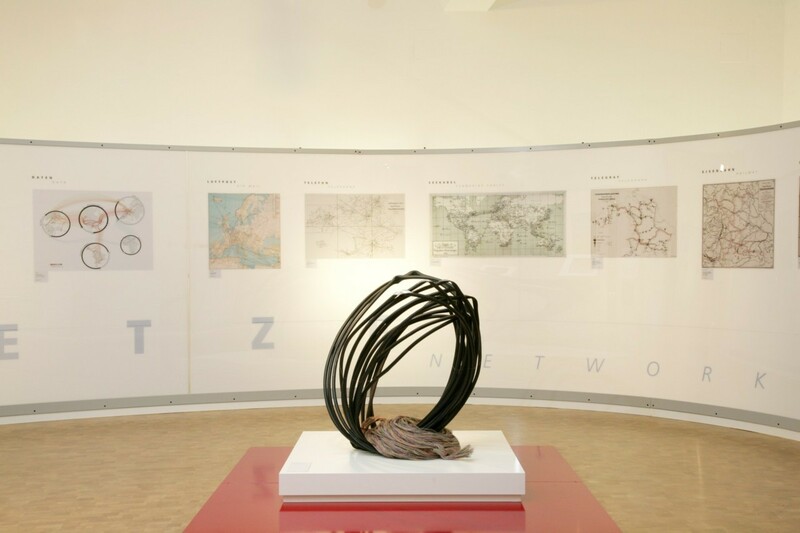 This innovative exhibit showcases a series of data visualization artworks by artists, designers, journalists, and innovators—including our 2014 Submarine Cable Map. Titled Protectors of the Internet, TeleGeography’s contribution catalogs the fiber-optic cables that traverse the bottom of the ocean floor and the handful of companies that install and maintain the global internet undersea backbone. 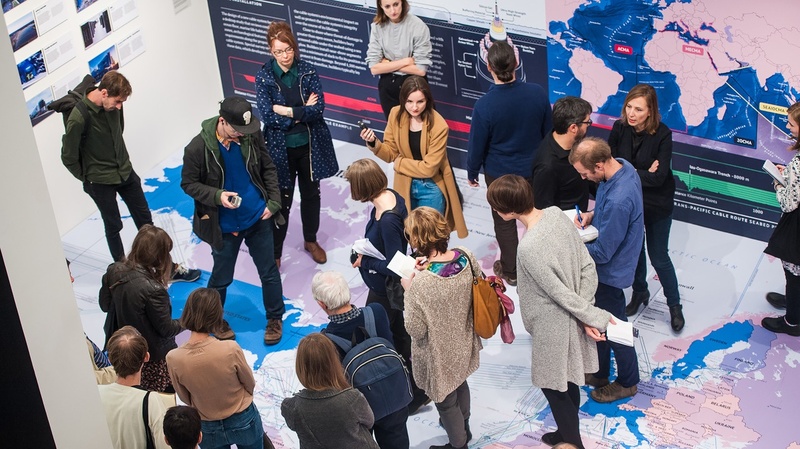 You can now catch the 2018 Submarine Cable Map in the Victoria and Albert Museum as part of The Future Starts Here exhibit. This exhibition curates more than 100 objects that highlight our future. Our visualization of submarine cables connecting the globe live among images of the world’s first carbon-neutral city, “aura-powered” bodysuits, and an autonomous sailing ship that cleans up oil spills. Like the look of these maps? 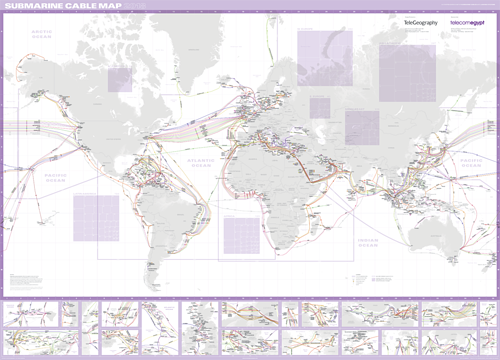 For a limited time, order a flat version of our 2018 Submarine Cable Map and get a free Global Internet Map with your purchase. Click here to learn more.